Low-cost traveller. 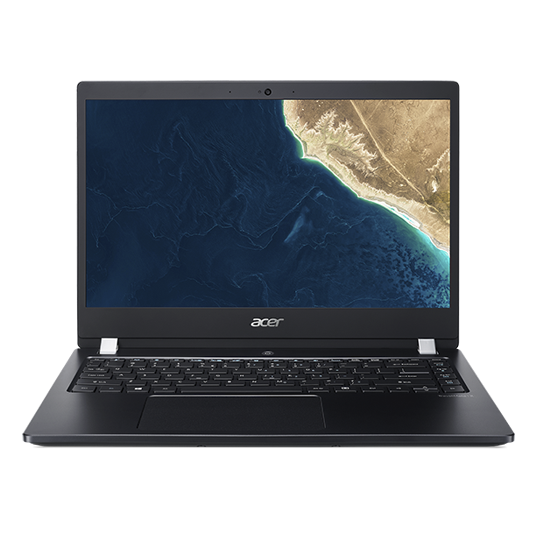 In typical Acer fashion, the TravelMate X3410 presents a lower-cost alternative to other popular business laptops. While there are some compromises in terms of case design, keyboard quality, and performance, the overall package presents a decent second-choice for those on a budget. 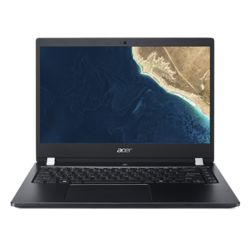 Acer is a well-known manufacturer, but their name is typically not the first that comes to mind in the business laptop market. Power players like Lenovo, HP, and Dell have ruled the business-class roost for decades. Acer actually has quite a few adequate office machines that are typically priced competitively and offer a good value. Today's review device is a perfect example. We looked at the TravelMate X3410 earlier this month and found a lot to like about its slim chassis and generally good performance. Today's review device is a variant of that model. 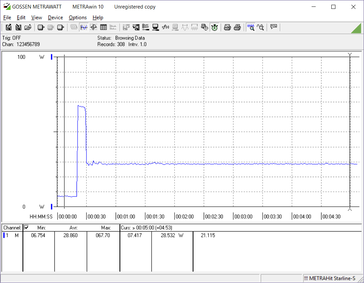 The X3410-M-866T we will look at today is mostly the same with two key differences. 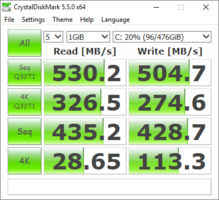 Firstly, the 1 TB HDD / 256 GB SSD combo of the earlier model has been swapped for a single 512 GB SSD. Secondly, and perhaps more glaring, the dedicated Nvidia GeForce MX130 GPU is absent; only the onboard Intel UHD Graphics 620 chip is available for graphical workloads. The other specs (Intel Core i7-8550U, 16 GB DDR4 RAM, FHD display) are the same. We will skip over the external components of the TravelMate X3410, including the case, connectivity, and input devices. You can find details for these features in our original TravelMate X3410 review here. The TravelMate X3410 faces steep competition in the business laptop arena, including Dell's Latitude 7490; HP's EliteBook 840 G5; Toshiba's Tecra X40-D; and Lenovo's ThinkPad T480, ThinkPad T480s, and ThinkPad X1 Carbon. 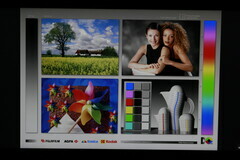 The display on the earlier TravelMate X3410 was a definite weak point, and the newer model doesn't fare much better. This is because Acer offers only one display option. The 14-inch Full HD (1920x1080) IPS panel is more than sharp enough for office work, but the backlight it weak, averaging a measly 210 nits. Most other office laptops hover near or above 300 nits, far outpacing the TravelMate. 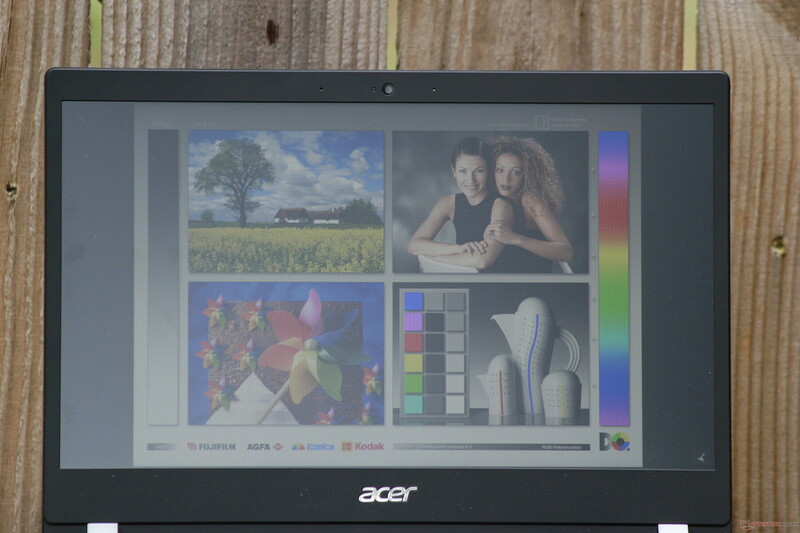 Worse still is the Acer's uneven backlight; brightness distribution sits at a modest 77%. 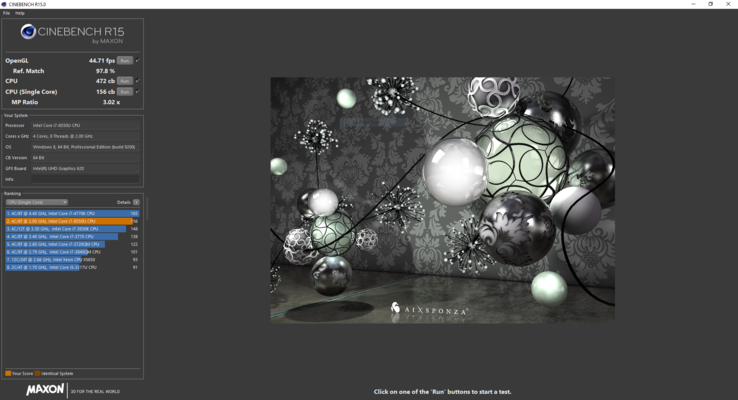 The lower corners are noticeably dimmer than the middle, particularly on gray and black backgrounds. The contrast ratio is decent at 844:1 but still falls behind rivals. 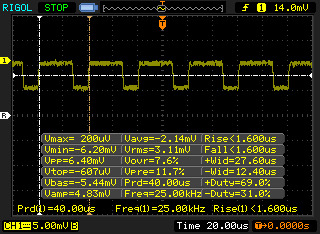 On the plus side, PWM shouldn't be a problem; we measure 25,000 Hz at brightness levels at or below 21%. The TravelMate is fairly color accurate. The average DeltaE2000 is 4.71 for colors and 3.4 for grays. These are reasonable numbers, particularly for an office laptop; most business-class notebooks aren't renowned for their color accuracy. 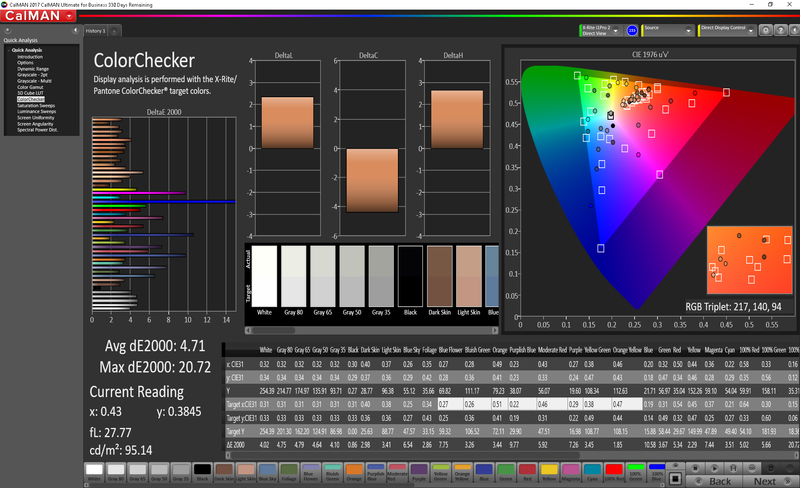 (For reference, a DeltaE2000 of 3 or less is generally considered acceptable for professional color work). The primary concern for colors is the wide variance in certain wavelengths, particularly blues and purples. 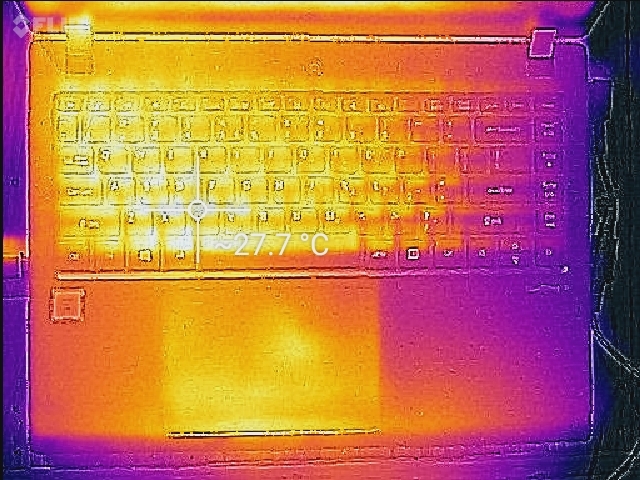 Again, this variance isn't unusual for an office laptop. 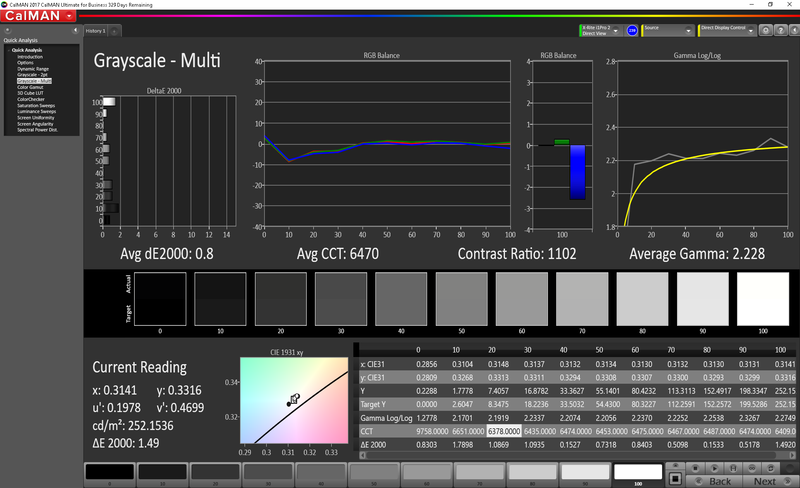 Gamma is a bit low at 1.997 (ideal is 2.2); grays look a bit lighter as a result. 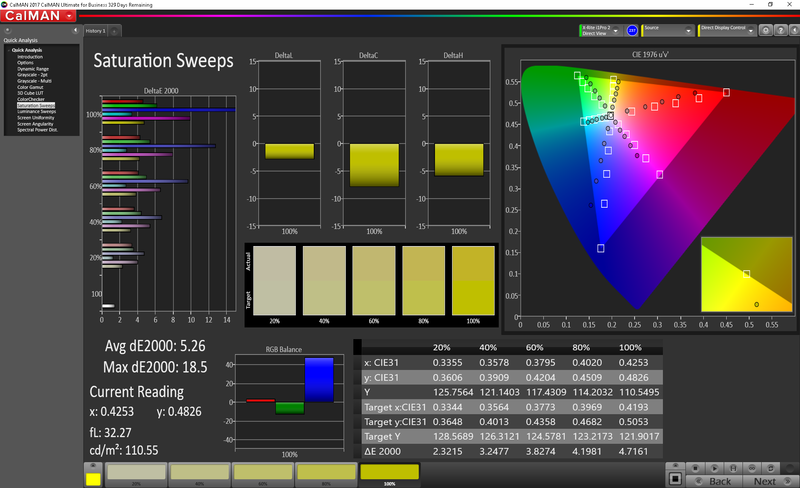 Colors are largely adequate for office work with one exception: color temperature. 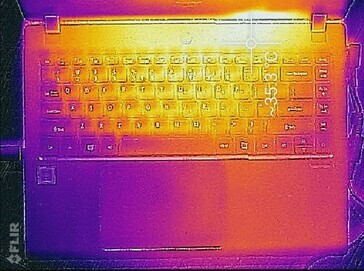 At 6266 K, the screen is too warm. White backgrounds tend to have a yellow tinge to them which may be distracting to some users, especially those that use an external monitor in addition to the built-in display. 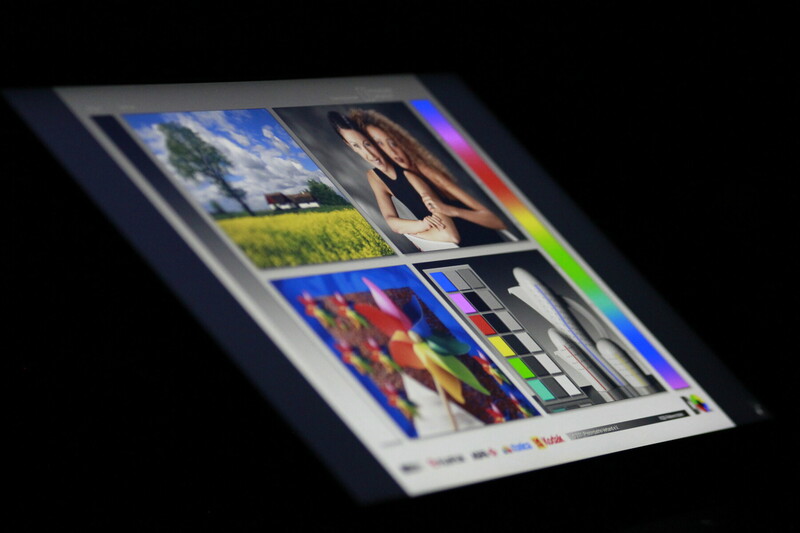 Color coverage is low. The TravelMate covers only 62% of the sRGB color space. This should be adequate for most work, but considering some competitors cover nearly all of the sRGB gamut, there is room for improvement here. Because of its IPS panel, the TravelMate has good viewing angles. Colors remain stable at almost any angle, and text and images remain clear. 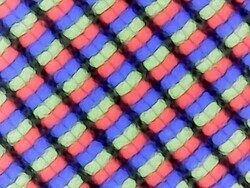 The screen noticeably dims when viewed about 20° off-center on the vertical axis; there is an initial drop in perceived luminance, but the display remains stable after this initial shift. The TravelMate features a matte display, which drastically helps to reduce glare. Still, the weak backlight struggles in bright situations. Even under overcast skies, the screen can be hard to use and may make users squint. Bright lights should be avoided. The matte finish also creates a grainy film that is easily seen. 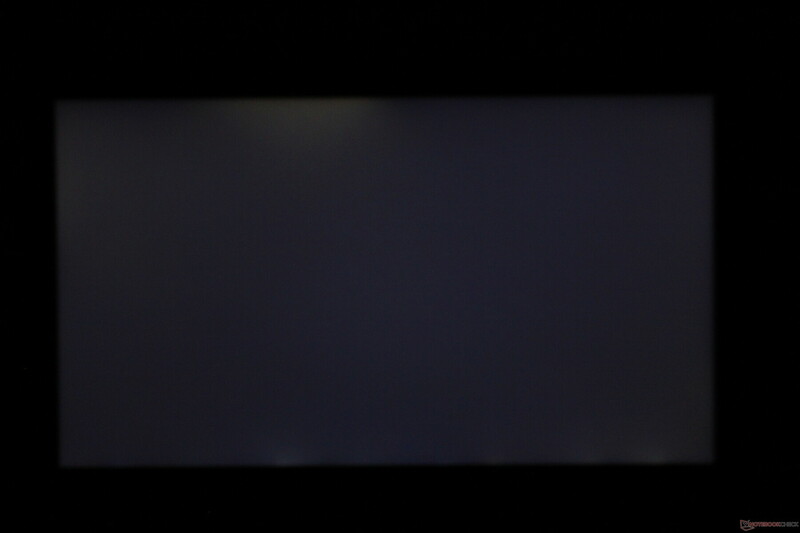 There is backlight bleed present along the bottom edge of the display, but this largely goes unnoticed. The bleed can be seen in a pitch black room but is otherwise not distracting. Display under overcast skies. Notice the grain caused by the matte finish. Minimal backlight bleed along the bottom edge. The bright spot along the top is an artifact in the photo and is not present in reality. 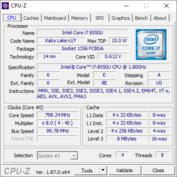 Intel's Core i7-8550U is the de facto CPU for modern premium Ultrabooks. Unfortunately, the TravelMate is not the best example of what an Ultrabook can do in 2019. Performance is decent but falls behind rivals. 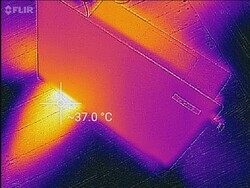 The gap is wide enough to make us question whether or not Acer intentionally throttles the CPU to keep heat and power consumption low. Add to that a SATA SSD in lieu of an NVMe drive used in most premium laptops and the Acer TravelMate X3410 leaves little question as to why it is cheaper than other business-class notebooks. 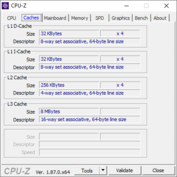 Intel's 8th generation ULV processors bring a much-needed feature to Ultrabooks: Hyperthreading. 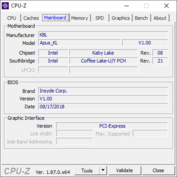 The Core i7-8550U is one of Intel's top-tier offerings for Ultrabooks; with four cores and eight threads, the CPU packs a lot of performance into a 15 Watt package. Unfortunately, thee TravelMate X3410 can't keep up with the competition. 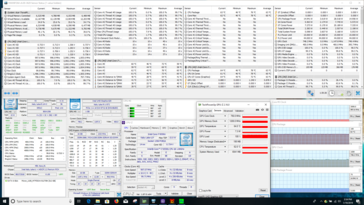 In Cinebench, the TravelMate shows decent single-core performance. Multi-threaded performance is very weak, though. 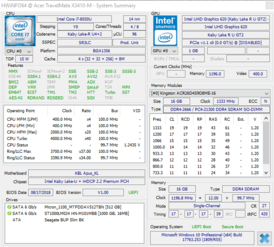 With a score of 472, the TravelMate falls almost 20% behind other 8550U-equipped Ultrabooks. The culprit is likely intentional throttling by Acer; as we will see in our stress test below, the CPU can't seem to hold on to its rated boost of 4.0 GHz for long. The lower performance has one benefit: long-term performance is relatively stable. Aside from an odd drop halfway through our Cinebench R15 loop test, the TravelMate manages a consistent score over 30 runs through the benchmark. Performance is unchanged when the TravelMate is on battery power. For more information about the Intel Core i7-8550U, please see our dedicated processor page here. Overall system performance is adequate. In a vacuum, the TravelMate is responsive and quick. The machine can handle any office work or light tasks thrown at it. Heavier workloads will require patience. Compared to other office Ultrabooks, the TravelMate feels much slower. 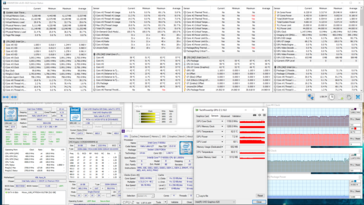 The CPU throttling we observed earlier is partly to blame, but so is the slower SATA SSD. Most modern Ultrabooks use an NVMe drive, which is noticeably faster than the aging SATA standard used by the TravelMate. All said, the TravelMate is perfectly adequate for most office work, but there are quicker devices readily available. Lenovo's ThinkPad line come to mind. As we mentioned above, the TravelMate X3410 employs a SATA SSD rather than a faster PCIe NVMe drive. The choice of drive was likely made as a cost-cutting measure, but the drive is noticeably slower than those of competitors. 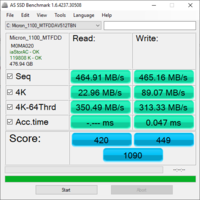 The Samsung PM981 NVMe SSD used in Lenovo's latest ThinkPad devices is about four times faster than the Micron 1100 SATA SSD in the TravelMate. 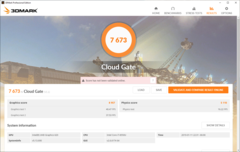 In daily use, the TravelMate will feel responsive and apps will load quickly, but those used to NVMe drives may grow impatient with the X3410. 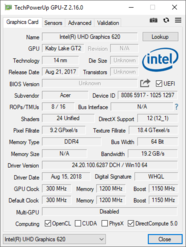 The Intel UHD Graphics 620 is a reasonable integrated GPU for office laptops. 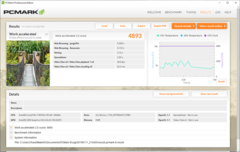 Unlike the CPU, the iGPU seems to run at expected speeds and offers expected performance. 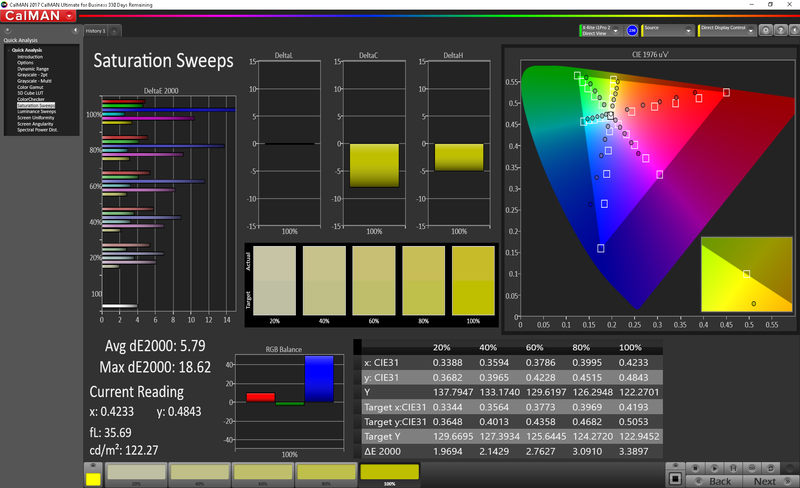 That said, the UHD Graphics 620 chip is not known as a graphical powerhouse. Its main purpose is to process pre-rendered media (e.g., Netflix streaming at 4K) and support up to two external monitors in addition to the built-in display. 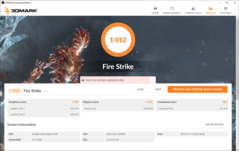 The iGPU can support a single 4K monitor at 60 Hz but only through a DisplayPort. As the TravelMate only has an HDMI port and a VGA hookup, 4K at 24 Hz is as high as the device can go. As far as graphically intense workloads, the Intel UHD Graphics 620 chip performs as well as can be expected. 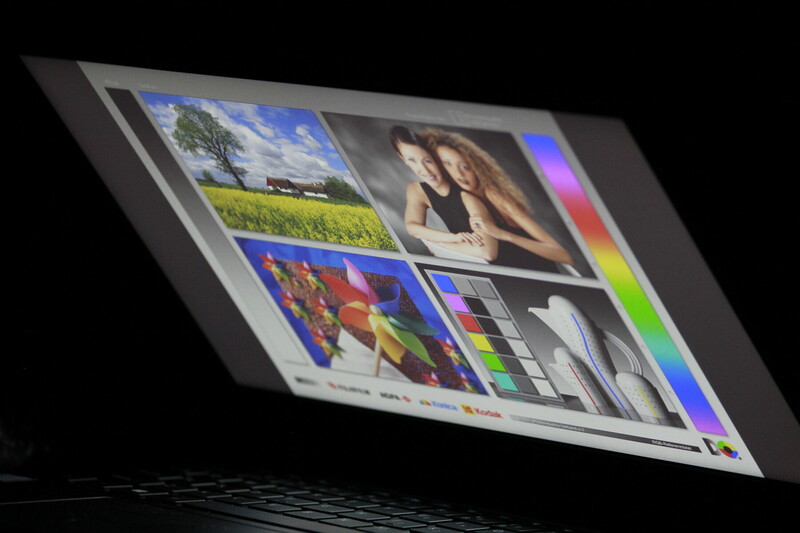 That is to say, the iGPU is not designed for rendering, photo/video editing, or other graphical workloads. For more about the Intel UHD Graphics 620 iGPU, please see our dedicated GPU page here. Gaming is a definite no-go on the TravelMate. Some lighter indie titles like Stardew Valley run well and are smooth, but modern 3D titles are practically unplayable. Even older games like BioShock Infinite strain the iGPU; the game is somewhat playable at low settings and 1024x768 resolution, but pushing the dials any higher results in a bad experience. Stick to light 2D titles. The single fan is well-tuned and inoffensive, but the system's fan curve is aggressive. Under light workloads, the fan remains off and the system is silent save for a bit of coil whine (heard from about 1.5 feet away from the device). Under a standard workload, the fan turns on intermittently for about 30 seconds before shutting off for a few minutes. Heavier workloads cause the fan to stay on permanently and pulse between 33 and 36 dB(A). The fan will burst up to 36 dB(A) for about a half minute before ramping back down to 32-33 dB(A) for a period. Thankfully, the fan has a low pitch that blends in with normal background noise. 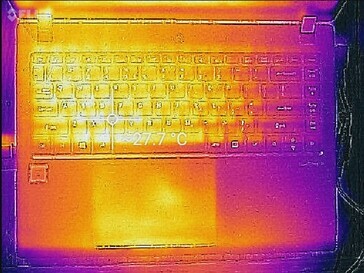 Temperatures across the device are excellent. The outside case never eclipses 40° C, even under full stress. The hottest part of the chassis is on the bottom panel directly over the CPU. This spot only gets warm to the touch. Lap use is thus possible under most workloads, although knees may get a bit clammy. 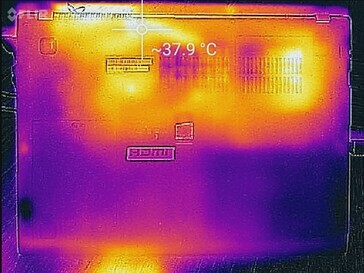 Internal temperatures are equally well-managed, almost to a fault. 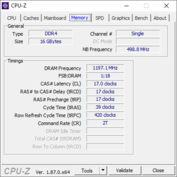 Under CPU and GPU stress, the system indeed throttles heavily; Prime95 keeps the CPU near its base clock, while FurMark brings the processor even lower to 1.0-1.2 GHz. Unigine Valley, a more realistic workload, sees better clocks; the CPU hovers between 2.8-3.1 GHz while the GPU sits at its rated boost of 1150 MHz. The heavy throttling under the synthetic benchmarks (i.e., Prime95 and FurMark) is curious. 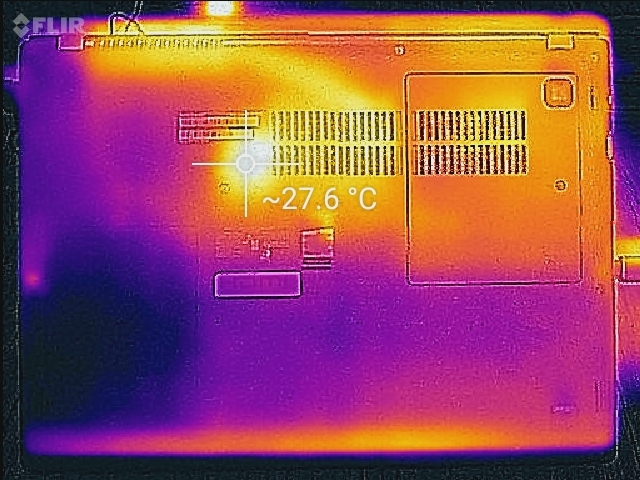 Temperatures across the CPU die stay between 62-64°C. 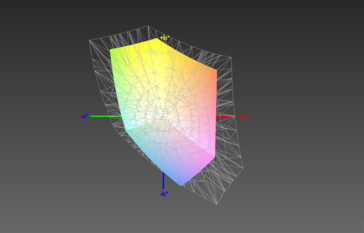 There is plenty of thermal headroom to push the chip further. Instead, the TravelMate throttles back quite a bit when synthetically stressed. 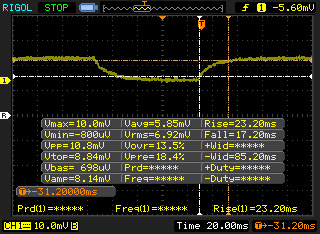 Unigine Valley produces results we would expect from the CPU, but synthetics cripple the system. 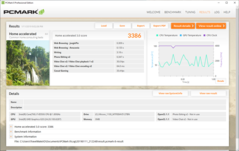 Acer may have been too aggressive with CPU management. The speakers are typical for a business-class notebook, but that's not a good thing. The down-firing speakers don't get very loud and are very tinny. 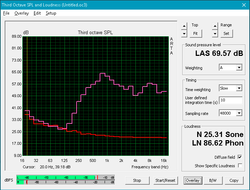 Bass is almost non-existent up through the mid-range registers, making the overall sound feel thin and weak. 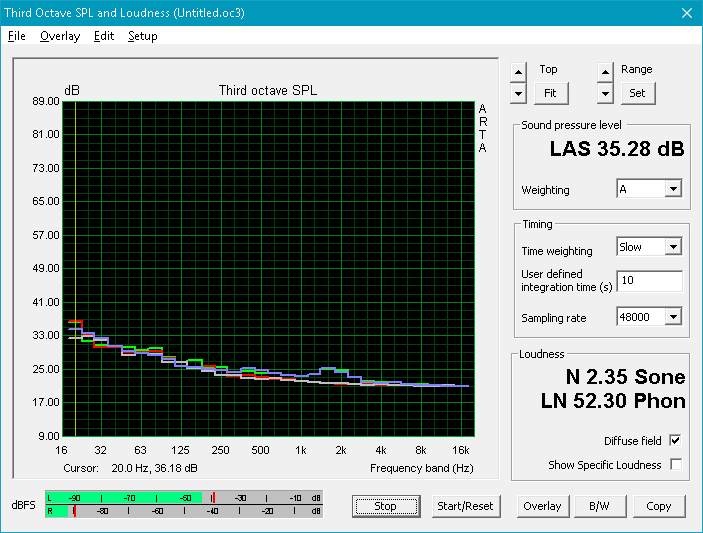 The speakers also distort at higher volumes (~85% and higher), further impeding the overall sound profile. Analyzing power draw gives us a clearer picture of the throttling we've seen in benchmarks. The TravelMate pulls about 30 Watts on average when under load, which is a fair bit less than many other Ultrabooks with 8th gen ULV CPUs. 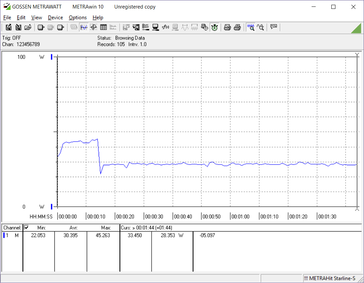 Looking at power draw when running Prime95, there is an initial spike as the benchmark begins followed by an immediate drop, which indicates CPU throttling by reducing power draw. 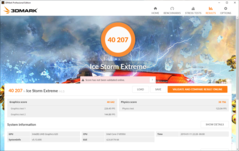 Running 3DMark 06 tells a similar story. Again, this throttling is curious as the TravelMate definitely has the thermal and electrical headroom for higher performance. The included 65 Watt adapter should be adequate, though the TravelMate can hit or exceed this rating for brief moments under extreme stress. The machine does not stay at these levels for long and quickly drops back down to ~30-35 Watts. Prime95. 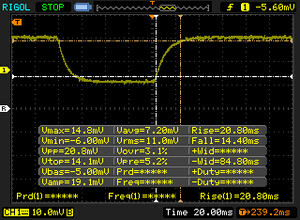 Note the drop in power draw as the test begins. 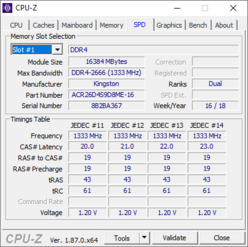 One of the benefits of throttling the CPU's power is increased battery life, and this may be one of the primary motivators behind Acer's design. 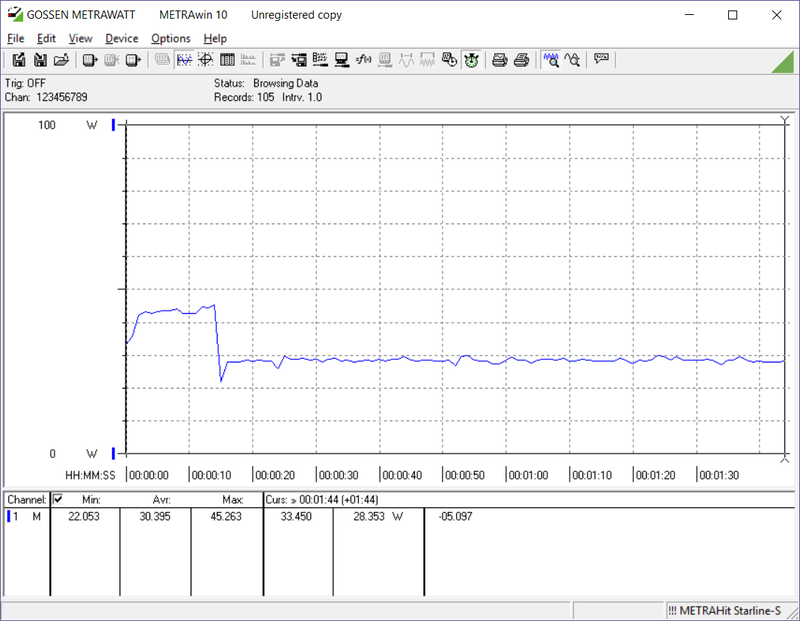 The TravelMate easily lasts 10 hours in our WiFi v1.3 battery test (screen at 150 nits, loading a new webpage every 30 seconds). These runtimes can be doubled if the screen is turned all the way down and workloads are light (e.g., reading documents). While it's now common for a business Ultrabook to just manage a full 8 hour work day, the TravelMate allows for work to be done on a train commute home as well. It should be noted that other manufacturers typically sell models with larger batteries for longer runtimes. Lenovo's ThinkPads offer hot-swappable batteries in three different capacities. The Acer TravelMate X3410 is a good example of compromise. At US $1300, the TravelMate X3410 offers a portable and well-built chassis, a good amount of storage (512 GB), and adequate performance for office work. That said, the device falls short in almost every category when compared to its rivals, particularly Lenovo's ThinkPad T480s, Dell's Latitude 7490, and HP's EliteBook 840 G5. The TravelMate's keyboard is responsive but feels cheap, the display is dim and grainy, and performance is heavily throttled with little reason. Battery life is excellent, but some rivals (like the ThinkPad T480) offer multiple battery configurations for longer runtimes. 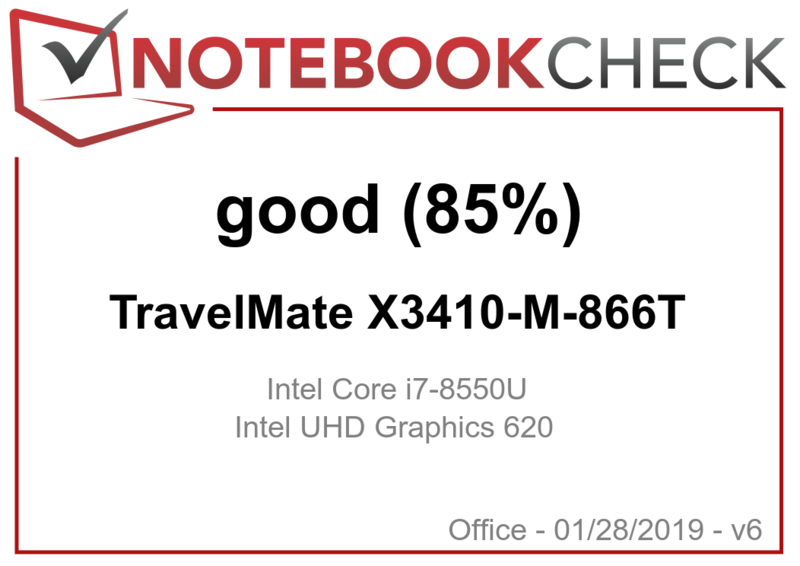 All said, the TravelMate X3410 is a "good enough" business laptop. Those on a budget that want a thin and light office machine and don't mind compromising on a few key features may want to look at the Acer TravelMate X3410, but most users should pay a few hundred dollars more to get a better machine.